Do you like your swords and sorcery? Do you like sitting in a room with similar minded people pretending you are a half chaotic dwarf with a +10 throwing hammer with latent magical abilities? Then this is the movie for you and then some. For the rest of us, it's a nice little B grade romp through fantasy land. This movie is set in realm of Imzer (which is it's own city, not actual featured in the D&D games) for the sake of this feature. It is ruled by the mages under the govern of an Emporer or Empress as the case may be and this is the way it has been for many many moons. Trying to bring democratic process is difficult due to fact that the mages, lead by Profion (Jeremy Irons), like being in power and believe their only recourse is to do away with the Empress. What follows is a political power struggle as each faction seeks to find a valued golden rod that has the ability to control the most noble and intelligent beast in the land, the revered Gold Dragons. Throw into the mix two thieves and an elven tracker who are in the wrong place at the wrong time and it makes for one hell of an adventure! 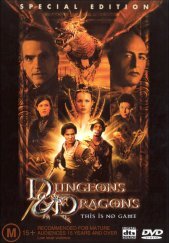 Dungeons and Dragons does it's best to stay true to the game that it's name after and for the most part it succeeds. There is all manner of bestiary in the movie that looks brilliant and in some cases, even convincing. I especially enjoyed seeing the Beholder and of course the animations of the dragons were sensational as well. As far as doing credit to the format goes, this title is excellent with great quality in both picture and sound to the point that there is really nothing to complain about. A great transfer and an audio mix that will keep your sound system busy in both wonderful Dolby Digital 5.1 and DTS options. This disc is indeed a special edition as promised with loads of extras to keep fans busy for ages. My only gripe is that you have to answer questions to even get through to the special features and whilst they are multiple choice and can be solved simply by process of elimination, it's more annoying than anything else. In addition the cursor is very slow to display the options and it appeared that you only had access to certain parts of the special features when you had viewed others. I tested this on two machines and it happened on both. I have researched it however and it seems that it is just an extremely slow cursor. I recommend this movie and would suggest it to anyone who wants a bit of light hearted fun served up with a dash of swords and sorcery. Great fun.